Search people, places, pictures & more. 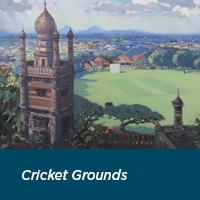 Marylebone Cricket Club Collections is one of the oldest sports collections in the world and comprise fine and decorative British art, as well as an unparalleled Library and film / paper Archive held on-site at Lord’s Cricket Ground in Central London. MCC is dedicated to improving access to its Collections for the learning and enjoyment of all.